Timber frame home receives an award from the National Association of Home Builders and the Building Systems Councils. Riverbend has long been known for both its outstanding designs and beautiful, high quality timber framing. Michigan home producer, Riverbend Timber Framing, received honors during the 2018 Jerry Rouleau Awards for Excellence in Marketing and Home Design presented by the Building Systems Councils (BSC), part of the National Association of Home Builders (NAHB). The awards were handed out on Oct. 10, 2017, during the BSC’s “2017 Building Systems Housing Summit” the only national conference and educational event focused exclusively on the systems-built industry. For more than a decade, the BSC’s awards program has promoted excellence in systems-built housing. Front runners in the industry are honored at the annual awards presentation for their innovative marketing strategies and unique designs. 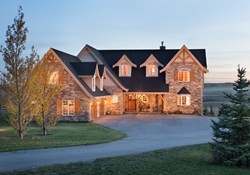 Riverbend Timber Framing won a first place award, Excellence in Home Design – Timber Frame: 3,001 – 4,000 square feet, for their architectural design of the Airdrie Residence, an old-world inspired timber frame home. The annual Jerry Rouleau Awards for Excellence are judged by an independent panel of industry experts. For a complete list of award winning companies, as well as winners and projects from previous years’ competitions, visit the BSC's website. ABOUT Riverbend Timber Framing: Riverbend is a leader in the design and production of amazing timber frame homes. Using a complete building system that includes structural insulated panels (SIPs) and insulating concrete forms (ICFs), Riverbend provides clients with a highly energy efficient, structural envelope. Riverbend is part of PFB Custom Homes Group, LLC which includes additional brands, PrecisionCraft Log & Timber Homes, M.T.N Design, TimberScape and Point Zero Homes. Visit http://www.riverbendtf.com to learn more. ABOUT THE BSC: The Building Systems Councils of the National Association of Home Builders is made up of manufacturer, builder, and associate members who advocate building with concrete, log, modular, or panelized systems. Systems-built homes are constructed to the same code standards and reflect the same, and often enhanced, quality levels as any site-built construction. The advantage of systems-building is it’s done in a fraction of the time, with a fraction of the waste, which can significantly reduce costs. Many systems-built homes also are inherently environmentally friendly adding a “green” label to the finished home.